The handcrafted spirit in a process carried down through tradition. This is a place where the quaint, traditional townscape remains, isn't it? 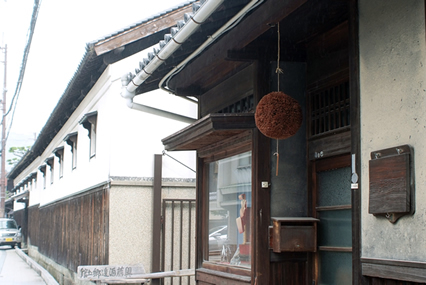 This area was blessed from the Bakumatsu to the Meiji periods as the shipping port for Ako's specialty salt. 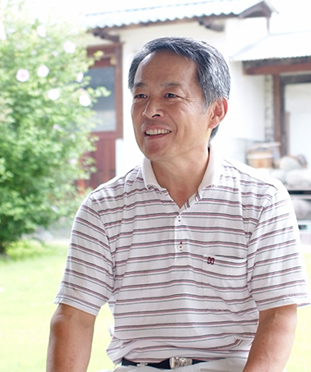 The Okufuji family built their fortune in the shipping industry and became a powerful house in the region. They began producing sake in 1601. At the time, they were the patron sake for Ako's feudal lord, the Asano family. There is an interesting story from that time. "Once when the master of the house gave tea to a white haired old man who came from nowhere in particular, the old man said nothing but left a bale of rice and a ladle. The master looked at the bale and the ladle and thought 'this can only mean he wants me to make sake,' and so he began." Now, we have created a folk museum for the tourists who come to the brewery grounds. 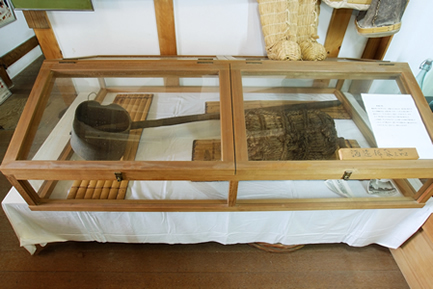 The actual legendary bale and ladle can be seen there. The oldest brewery building is from over 300 years ago, so I think you can feel the same ambiance as the Sakoshi townscape. 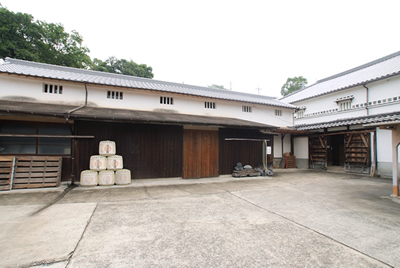 What do you focus on as a famous sake brewing family with a 400 year history? itself throughout the history of the Ako Domain. In the past we had a lot of brewers, but now just I and two young brewers do the brewing. I used to do cross-industrial work and I fumbled a bit at the beginning. I learned directly from the brewers who came to our brewery, and was given advice and taught the basics by senior sake brewers in the Harima area, in pursuit of a taste worthy of our name. We pay attention to the traditional handmade process. Into the fresh waters of the Chikusa river, we add the Harima sake rice, which is an ideal ingredient for sake, and use the traditional careful brewing process. Ako is famous for Chushingura, and our representative brand is called "Chushingura" as well. Just as the fiercely loyal masterless samurai, we carefully brew the sake so the handcrafted goodness comes out in the taste. Currently, we are the only sake brewery in Ako. I would like for people all over Japan to drink it as Ako's sake and feel its great taste. What are the features of the Chushingura series? What we aim for, more than a light dry sake that you gulp down, is one with a rich taste that you savor. Sake with a high alcohol content and powerful volume, yet an aftertaste that makes you say "one more" - this is the kind of sake we are aiming for. 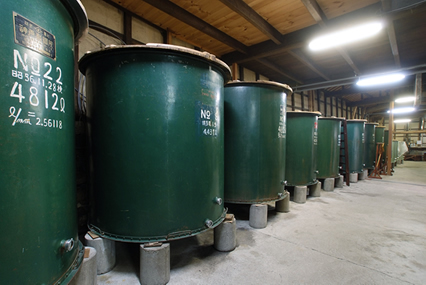 We have "daikinjo", "junmai ginjo", and "yamai junmai" types, each with a deep fine taste. The Chushingura goes well with the similarly fine Setouchi seafood. The Sakoshi area where the brewery is located is very active in oyster cultivation. I hope you'll try our sake with oysters. I recommend vinegared oysters or grilled oysters. I think that our sake would go splendidly with Himeji's specialty grilled eel. It seems they also make sake with locally grown rice. is said to go well with the refined taste of seafood from the Seto Inland Sea. Recently we have made sake with rice grown by the students in Kamigori High School's agricultural course. Some of the students came to experience sake brewing on an internship as well. By going through the steps of sake making together, washing, processing, and pressing rice, I think that the students were moved. We have been continuously working in this community, so we want to do something to give back to that community. It is important to continue with the idea that sake brewing is local brewing. I think that by fastidiously making sake by hand in this historical brewery, we are developing the regional taste. Now our production volume is small, but we are doing our best to increase it, and we will continue to protect this brewery so that many people throughout Japan can come to know our sake as "Ako Sake". Old-fashioned recipe that has to Yamaoroshihaishijikomi the Shubo. And to enjoy the taste with the thickness, the strength of the waist. The rice milling to 55% Yamada Nishiki, was charged carefully, taste of sake original soft smooth. Elegant taste gives off a gorgeous aroma, lack the skill to the need for brewers and Yamada Nishiki rice that has up to 40%. You can't enter the Warehouse, but you can see our brewery museum.